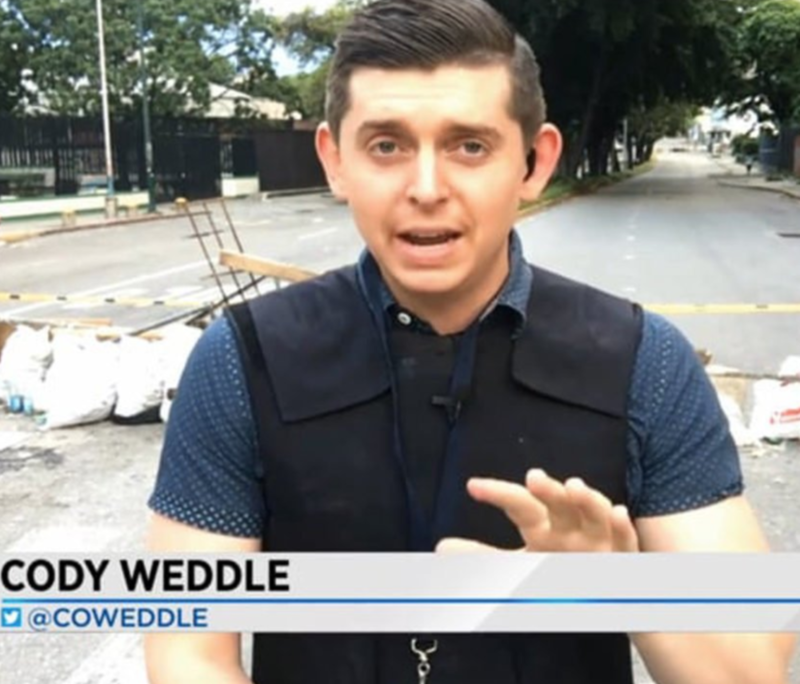 Needless to say it was a bit of a tense day for WPLG Reporter Cody Weddle yesterday. Weddle has been covering the story coming out of Venezuela and it was clear that not everyone liked what he was reporting. WPLG reports that early Wednesday morning, a group of black-clad agents with bulletproof vests and an order signed by a Venezuelan military judge raided his apartment and took him away in a Jeep. Weddle said he was held for several hours alone with a ski mask covering his face. Weddle said guards searched his cellphone and computer and would sporadically question him about his work. He was not hurt, but he said he was without food and water during the interrogation. "It was clear they didn't like my reporting," Weddle told Local 10's Louis Aguirre. "They were interested in a story I did about the current atmosphere in the armed forces." Weddle said the agents accused him of treason, espionage and removing military artifacts. After the interrogation, he said Venezuelan counterintelligence agents left him in the custody of Venezuelan immigration officials at the airport. Weddle said he was at the Simon Bolívar International Airport in Maiquetia waiting to board a flight back to the United States. Weddle said officials told him he was being deported, but it was unclear exactly when he would return.